Entertainment events are the major attractions of any Durga Puja festival. The Puja organizers spend thousands of dollars to get the most popular artistes from India as well as from the local talent pool. It is the star entertainers that pull in the crowd, and crowd brings in revenue. The popularity ratings of the entertainers define the success of a Durga Puja. But is it true? 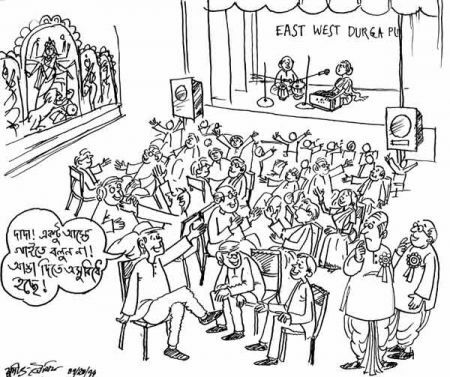 If the stars and their entertainment was the only reason to attend a Puja festival, then why do we have to listen to the constant rumbling noise of numerous “adda” sessions that continue in the background? As the audio levels of the performers rise, so does the noise level. To many attendees (myself included) the main attraction of attending a Puja is the opportunity to meet friends and engage in endless “addas”. We have no ill feeling towards the performers, they can continue to do their job as long as they don’t disturb our “addas”. After all, it is them who made us decide which Puja to attend – but they cannot deny us our birth right to be able to talk, talk and talk for hours on. We will occasionally listen to one or two songs to give our tired jaw bones some rest, but soon we’ll get back to argue about who was the best performer of the song, and how this “hopeless” artist has ruined the song completely. We’ll lament the dearth of talent in Bengal and how we miss the golden days of Kishore and Hemanta-da, how the new generation of band music is destroying Bangla music and why one should ban artistes like Sumon and Nachiketa. This entry was posted in Arts-Culture, Cartoons, Generic, Social and tagged adda, Dura, entertainment, Puja, pujo by sudipta. Bookmark the permalink.